Wildly popular food blogger and critically acclaimed author of The Ancestral Table returns with over 200 weeknight-friendly dishes that taste so good, you'll finally throw out that emergency stack of takeout menus hiding in your kitchen drawer. Despite knowing full well that most restaurant and take-out foods are churned out at a rapid pace using unhealthy ingredients laden with chemicals and additives, most of us can't seem to shake the desire for even just a taste. Not to mention that nothing is easier than picking up takeout, hitting the drive-thru, or ordering delivery, but at what cost? Paleo Takeout: Restaurant Favorites without the Junk delivers much healthier but equally satisfying alternatives, offering delectable recipes that mimic the flavors of our drive-thru and delivery favorites--Paleo style! Russ Crandall teaches you step-by-step how to prepare each meal in under an hour--leaving no sacrifice of taste or time. In Paleo Takeout, Crandall re-creates everyone's favorite takeout meals using wholesome ingredients and some seriously inventive techniques giving you the opportunity to revisit your favorite restaurant classics, with all of the gratification and none of the regret! 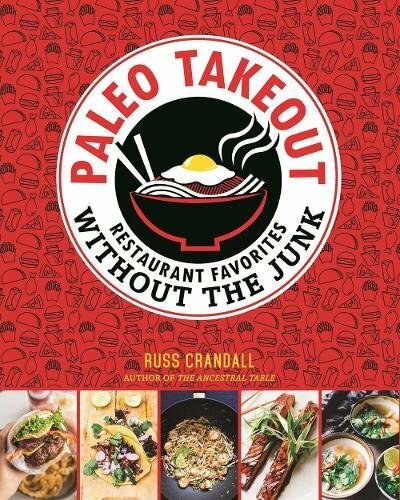 Inside Paleo Takeout, you'll find over 200 recipes inspired by beloved restaurant experiences: Chinese, Korean, Japanese, Thai, Vietnamese, Indian, Italian, Mexican, Greek, and American cuisines are all represented. Looking to re-create your local Chinese joint's best dishes? Choose from over 25 takeout favorites, like Sweet and Sour Chicken, Beef and Broccoli, Egg Foo Young, Char Siu, Chow Mein, and Spring Rolls. In the mood for curry tonight? Take your pick among your favorite Thai, Indian, and Japanese curry dishes. How about game-day wings made in 20 different ways, pizza that's better than delivery, or quick and easy burrito bowls? We've got you covered and then some. Using the same simple techniques that he learned while working in the restaurant industry, Crandall teaches you how to build a full-course meal in less than an hour. Simply put, Paleo Takeout: Restaurant Favorites without the Junk proves that eating right in a way that satisfies even the choosiest of healthy eaters is not only possible, but also a lot of fun! See below for what I've made so far and check out the author's blog The Domestic Man. The recipe is well written and every component offers solid flavor: the sauce is great, the chicken and coating are great, the coconut oil is even great (sometimes I find the flavor distracting, here it works). So glad I made a full batch so I’ll have leftovers to bring to work for lunch. I’ve made wings from a number of recipes but this one delivers on flavor, crispness, and still perfectly moist. Simple dry rub then 50 minutes in 400 degree oven. New cookbook landing in 2018 !